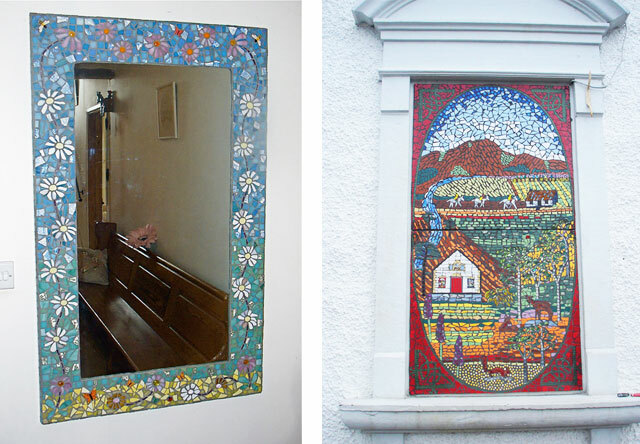 I make original and unique hand crafted mosaics from small gift-sized pieces for home and garden, to large bespoke creations for interior and exterior settings – see Commissions below. I like to use interesting combinations of materials in my mosaics often incorporating wonderful pieces of beach pottery found on the local shores. The qualities of the different materials themselves inform the nature of my work creating a lively play of colour, light, shape and texture. I take inspiration from many sources, much of it found in the patterns of nature and the ever-changing scenery around me. You can buy my work online, from my workshop or local craft fairs and galleries. Bespoke pieces to commission are welcome. There’s always the opportunity to personalise the mosaic and perhaps incorporate some of your own found materials. Payment by cheque or paypal is welcome or – for heavier items – cash on collection. I also can deliver where appropriate. I also offer bespoke mosaic classes and parties. If you have an idea for a mosaic in your home, garden, business or community or perhaps a special gift that can be personalised, I accept commissions large and small. If you want to discuss a commission please contact me. After a first consultation, I will submit a design for approval, discuss timescale and materials. I will request a part payment at this stage when the design has been approved and the initial order of materials is to be made. I will make the mosaic in my workshop, and if the project is large, I will request a second payment at the halfway stage. The final payment will be made on delivery. I am happy to deliver mosaics where appropriate. Though I will not be responsible for installing in situ mosaics, I can give advice on this and will make the necessary repairs over fixings. Mosaic commissions are priced according to the complexity of the design, type of materials used and siting. Small items can cost as little as £25 plus postage if required. Medium sized mirrors/wall plaques etc £45-£100. Large mosaic art works start at £600. If you are interested in a special commission for your home or for a loved one, please don’t hesitate to contact me.